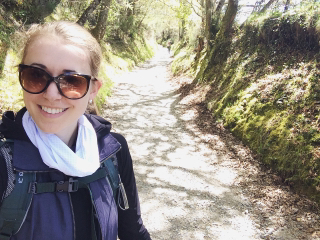 The next two weeks I will be walking a portion of the Camino de Santiago, walking approximately 25km a day, so I decided I would post about this journey! In addition, I will be posting about the rest of our travels (we are away for two months!!!). Since I will only be posting from my iPad, I had to format most of posts ahead of time, in terms of layout, as the apps aren't very sophisticated. As well, in order to keep my blog neat and tidy, I decided I would create one post per country we are visiting. 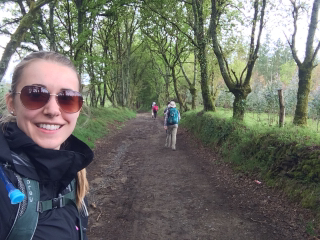 Therefore, I will only update this post for the camino, and won't create multiple posts! Hope that all makes sense - just keep checking back on this post each day, and hopefully (crossing my fingers) I will be able to post a photo and talk a little bit about how our day was. The Camino de Santiago is the name of any of the pilgrimage routes, known as pilgrim ways, (most commonly the Camino Francés or French route) to the shrine of the apostle St. James the Great in the Cathedral of Santiago de Compostela in Galicia in northwestern Spain, where tradition has it that the remains of the saint are buried. Many take up this route as a form of spiritual path or retreat for their spiritual growth. Our travel day was very very long! Starting on April 28 with a 7 hour flight to London heathrow, arriving the morning of April 29, then a 3 hour stop and then a 2 hour flight to Madrid, then a 2 hour stop and a 5 hour bus ride to get to Ponferrada. I get very travel sick, so needless to say, this was not a great day for me! Though I managed, and we finally got to the hotel around 9:30 pm, and went out for a late tapas meal followed by a long, well deserved sleep in an actual bed after so many hours sleeping upright on planes/busses. 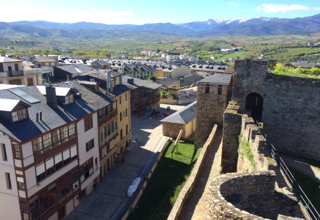 Day 1 has been very easy going and we have spent it exploring Ponferrada. 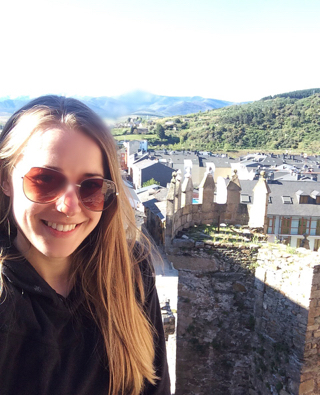 We visited Los Templarios Castle, as well as the Saturday market and walked along the river. The castle was beautiful as well as the views, allowing us to see all across the city. The market was huge and covered many streets with clothes, jewelry and fresh vegetable. We've been having trouble with the menus - all Spanish and all tapas. It's always a surprise to see what turns up. Just having a little siesta and then heading back out for tea and pastries. Day 2, or our first day actually walking, we walked 25km and it took a little over 5 hours. It started off very cold with many layers to very hot at the end. 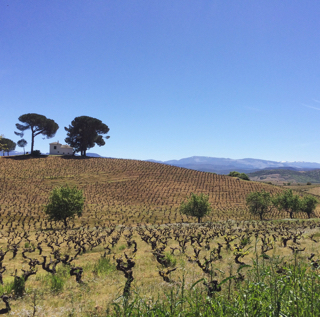 We stopped for lunch about 15km in and had lunch at the most beautiful restaurant, Casa de Comidas Prada a Tope. Probably one of my all time favourites. After lunch we walked a little further and hit a huge market with May Day/Octopus Fiesta celebrations, which was very exciting for us to see! Finally at the hotel, enjoying tea and a nice bath. No blisters today, but sore hip/back area from the packs - we think?! Tomorrow we have a long day ahead with a 30km "scenic route" hike. Day 3 was definitely brutal! We woke up sore form our first day and walked a total of 31km today. The first 20km was mostly along a road, which wasn't that exciting other than all of the cows and cats that we saw. We saw an abandoned house in a little village that had been taken over by cats so of course we gave them a little bit of ham from a sandwich. The last 10km was up hill. First, on a wide open road with the sun on us, which was killer. 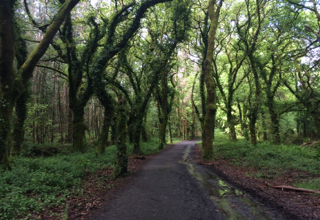 Then, it switched to a trail covered by trees, with a gravel path. 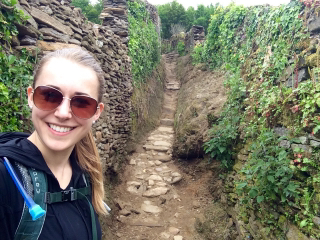 Finally, to the last part through little villages as well as on stone and gravel paths - all very uneven and uphill. 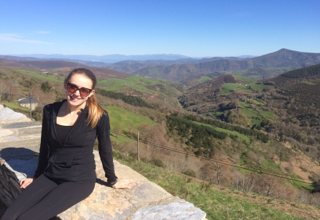 Once we arrived, the views made the hard work worth it, even though we are hobbling around in pain! The village overlooked many valleys and mountains in the distance with amazing views from all angles. We were quite proud of ourselves, only stopping around 18km for lunch and then not stopping again after! The temperature ranges are something I didn't expect though. We started the day around 3C and then at the hottest it was around 23C. Tomorrow is a much easier day with 21km of downhill! Day 4 was supposed to be an easy 22km, but going downhill isn't as easy as you initially think - especially when you are sore from the previous day! Breakfast was very basic and not enough for me this morning which made it a little harder to push through the first few km which were up and down. There were some flatter parts of the trail, but for the most part, today was a lot of downhill on gravel. Toes pressing against the front of the shoe, legs sore, hot sun. By the end of the hike, I was pretty dead and it wasn't even that far! Glad to be laying in bed right now, and with wifi unlike yesterday! Day 5 seemed a lot longer than we thought at the beginning. We decided to take the scenic route which was 25.4km vs 18km, which all sounded fine at the beginning. We went through a beautiful town called Samos and stopped for a snack, which was about 10km into our walk. The whole alternate route was based on this, as there was a pretty monastery there, and after cut across to meet up with the regular route. However, that little cut across on the map looked about 5km and turned out to be almost 11km and was never ending. The towns were small with no where to stop so we had to keep going. Finally reaching a cafe at the end, where both routes met. We had one of our new favourite, "safe" foods, tortilla, which is omelette with potato. Finally continuing on another 4.5km in the hot sun to our hotel. We were very happy to put our feet up after such a long day! Day 6 we walked 24km, a little more than expected, though the weather was great. It was cloudy with no sun, but that made the walk a little better as it wasn't so hot. It was supposed to rain today, but not until 2pm so we set out with the goal of arriving before that. 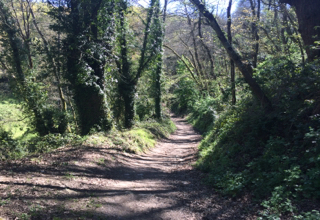 The walking today was a lot of uphill and downhill through little paths in the trees which we enjoyed but definitely not great on the sore legs! 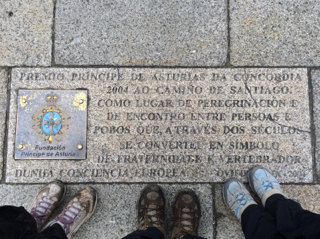 Also, to get a pilgrim certificate you need to have walked 100km, and where we started today was around 114km to Santiago, therefore many people start their journey here. This made the walk a lot more crowded and busy today, plus we saw a group of 30 or more students, so we spent a lot of time trying to pass them as well as other people. 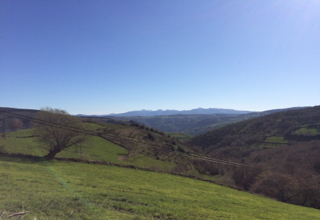 My favourite part of the walk today was approaching Portomarín, as we were walking with a beautiful view and then as we got closer we walked through a rocky tunnel, and you could see the town in the background. Very hard on the knees and legs but fun! Then, we walked over a very long bridge when entering the town, giving us some more great views! Tomorrow's forecast shows rain again but hopefully it is later in the day again! Day 7. A lot of rain. Splash pants, rain coat, pack cover. Wet. Lots of hills! 26 km of ups and downs. It sounds pretty terrible, but it was a cool experience! Though the rain did take away from the scenery a little, it was still pretty with many rolling hills. Again, many people on the trail. I don't think we had more than a km on our own, there was always someone in front of us. Before yesterday, we started out passing people and eventually we would be alone for a few km. Today, there was a brief moment when it was just the three of us, as we took one of the complementaria, side trails, when we ended up in a big field with no signs. Luckily we did find our way back to the trail without turning back, but we think it may have set us back a little. My knee has been bothering me a little since last night, it feels like an elastic band trying to stretch out, but stiff. Not really that painful luckily. Tomorrow is a long day. 29km! Again, in the rain. Day 8, long day! 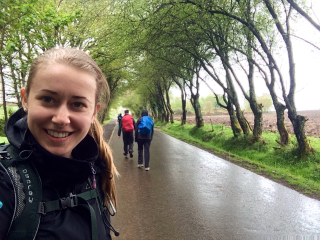 We walked 29km and the forecast said rain but we made it to the hotel before the rain started around 3:30. Definitely a lot better than yesterday. There was even a little sun peaking through at times! The trail had some hills but was a lot flatter than most days, making it a lot easier to walk 29km. You can tell the change in the region by the trails, as the past two days have been a lot of trees with moss, and covered woods areas. Luckily, we managed to keep ahead of the other pilgrims (walkers) today, walking very fast thanks to Chris... With the increase of pilgrims, it is also getting more and more commercial as we go on with more vendors of Camino shells and bracelets etc. 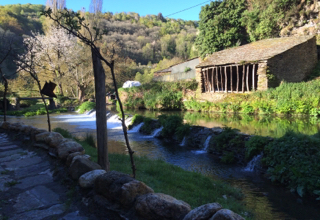 It's been a very tiring day, but we did an extra few km than the typical "stages" you see in the Camino books, so that we have a shorter walk in two days when we arrive in Santiago. Day 9, the last big walking day - 23km! Today we started off hoping to leave a little earlier to avoid the rain, and luckily managed to walk 11km with clear skies, then 8km of rain and the last few with sunny skies. A lot better than a full day of rain! The trails were similar to the last few days of very green tree covered trails with lots of ivy and moss. Very beautiful! The hotel we are staying in tonight is a very beautiful old mill. The owner said the dog would show us a trail to a cottage, so we followed the dog and it passed the cottage and continued to a beautiful trail down by the river. 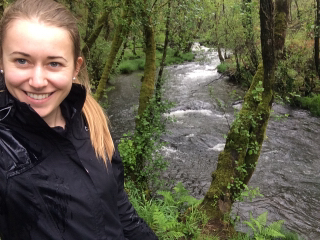 There were lots of trees and little waterfalls and at the end was a park and a swimming pool area in the river. Of course Chris needed to swim in it so we ended up walking back later. Very cool place! Looking forward to our arrival to Santiago tomorrow! Only 14km left! 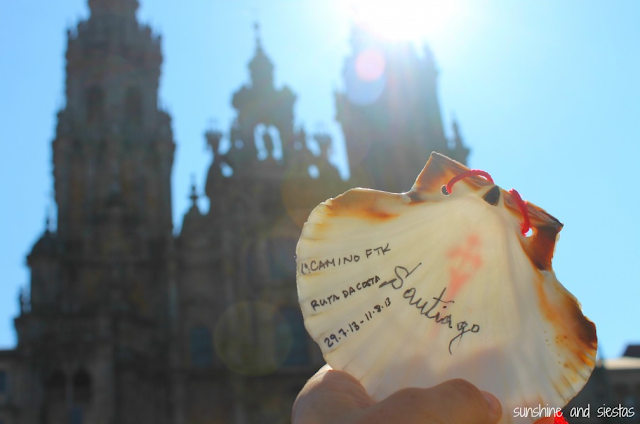 Day 10, our arrival to Santiago de Compostela! Again, the forecast said rain but we had clear skies for most of our walk with only a few drops in the whole 17km. The walk was a lot longer than we thought! The map said about 14km but it ended up being longer. Of course once we arrived to Santiago the rain started! We were able to check into the beautiful Parador de Santiago de Compostela hotel, and then head to the church to see the Botafumeiro. After that, we went and got our pilgrim certificates! We walked a total of 209km officially, and 223km that we had on our Fitbit tracker. We received the pilgrim certificate and a distance certificate as well as our final stamps on our pilgrim passport. We then explored Santiago a little, going into little shops, as well as a delicious tea in the Parador. A lot more exploring to do tomorrow! We were also interested to learn that the hotel we are staying in is considered to be the oldest continuously operating hotel in the world, and has also been called the "most beautiful hotel in Europe." It is the most beautiful hotel I have ever stayed in! Overall, it was a very exciting day completing our walk, to seeing the ceremony and getting our certificates!